Ask the Historian – Vernon Avenue? When? Where? Why? Wait, what? There’s an actual Vernon Avenue? The name was officially changed in 1931 by city council, resulting in a neighborhood protest and lingering resentment. This view of the evidence is looking southeast at Emerson Street. 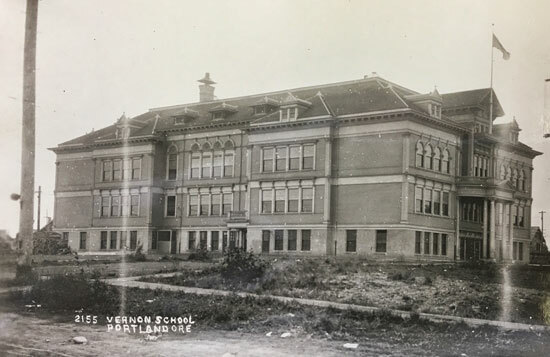 Last month, we reported on Vernon School in anticipation of its 111th anniversary. 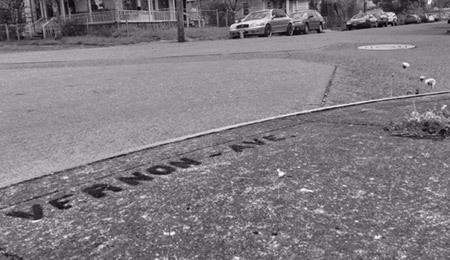 Speaking of Vernon, doesn’t Vernon Avenue sound like a street that you should know its location – especially since Portland has an entire neighborhood named Vernon? That street name is just an echo today because the actual Vernon Avenue was silenced Sept. 2, 1931. That’s when city council passed Ordinance 61325 readdressing all of Portland’s streets and calling for multiple street name changes. Before the renumbering ordinance, there was no predictable and systematic addressing system, which left everyone confused, including police, fire and the U.S. Postal Service. The great readdressing of Portland’s streets in 1931 was long overdue and helpful. But losing the name of your street, that one really stung. That street name is just an echo today because the actual Vernon Avenue was silenced Sept. 2, 1931. As a result, the six-block Vernon Avenue went extinct and became today’s 14th Place, running between Prescott and Killingsworth streets. In January 1933, neighbors along Vernon Avenue – angry about the change and still using their original addresses in resistance – presented a petition to city council protesting the switch. But city council denied the petition, saying an exception could not be made. We haven’t yet come across anything on the record about how neighbors responded to that denial. Eventually the passage of time dulled the loss as Vernon Avenue families grew old, grew up and moved on. But it’s worth noting that stories in The Oregonian, well into the 1940s, referred to addresses on Vernon Avenue when reporting births, marriages, deaths and social occasions. Doug Decker initiated his blog AlamedaHistory.org in 2007 to collect and share knowledge about the life of old houses, buildings and neighborhoods in northeast Portland. His basic notion is that insight to the past adds new meaning to the present. If you have a question for him to answer in CNews, send it to CNewsEditor@ConcordiaPDX. com. Thursday, Oct. 4, from 5:30 p.m. to 7:30 p.m. Vernon School will celebrate its 111th anniversary with an open house. All are welcome. The school’s motto “I Believe. I Belong. I Become,” is as true today as it was in 1931 when Gordon Hood entered the school among the first students in the newly rebuilt school. The old Vernon School had been an impressive all-wood structure that was built in 1907. It was destroyed by arson in 1932. At that time, there were about 500 students enrolled. There are currently 526 students at the new Vernon School, which was built in 1931 for $259,198. Medina Keita, 12 years old, is a bright, charming and creative 7th grader at Vernon School today. 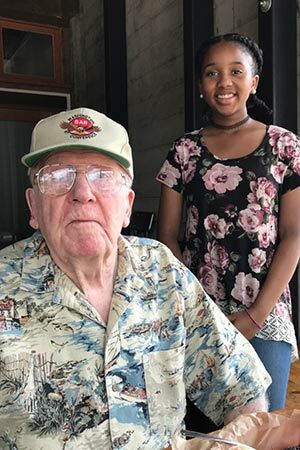 She visited recently with Gordon, a 92-year-old Vernon School alumnus who has fond memories and a sharp wit. One would expect vast differences in school experiences. However, the opposite was true. Although Gordon was not able to speak as specifically as Medina, there were many similarities in their Vernon experiences. Both have/had favorite teachers and classes, a fondness for their school and classmates, and a dislike of the cafeteria food. Today Vernon school is involved in an International Baccalaureate (IB) program which teaches world awareness and social issues that are detrimental to humanity. That’s a heavy burden for a preteen old, but one that teaches students to be more open minded. “The principle of the IB school is to challenge yourself as a learner,” Medina said. Gordon moved to Concordia and attended Vernon from 1931 to 1937. As the result of the 1929 stock market crash, his father had lost their home and business. The Great Depression lasted until the late 1930s, and was the most widespread depression of the 20th century. Gordon said his family moved to an apartment in Concordia that cost $12.50 per month. He left Concordia when his family purchased a home near Broadway for $2,800. In spite of his family’s hardships while Gordon attended Vernon, he remarked that it was a great school with great teachers. Both Medina and Gordon face social challenges with dignity. One could say the more things change the more they stay the same. We love it when readers write with a question about a specific building that’s had a long and interesting journey like this old church. 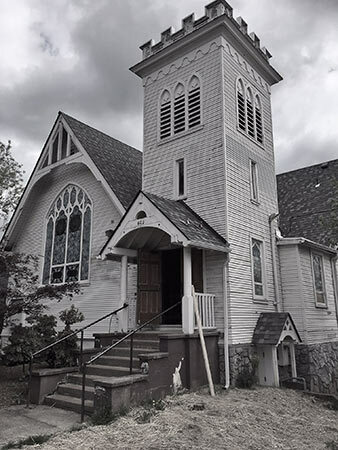 We know it today as the Portland Playhouse – and it’s recently undergone a major overhaul inside – but it started out life as the Highland Congregational Church Jan. 3, 1904. “The Rev. D.B. Gray reported the cost of the building was $4,709.15 and the 100 x 100 lot had cost $800. The community raised $600 and the Oregon Missionary Society provided the rest. From the mid-1920s until the early 1950s, the building was referred to as Grace and Truth Hall. Its most recent faith community was the Mt. Sinai Baptist Church, from the mid-1960s to 2005. The building was vacant for several years and, like many older area churches, was sinking under abandonment and deferred maintenance. It was bought by a private owner who lived in the old church for several years prior to its current incarnation as Portland Playhouse, a theater company. The first play in the church was in 2008 and, since then, Portland Playhouse has built a solid reputation for high quality and well-produced shows, and a loyal following. Michael Weaver, playhouse managing director, explained the church has recently undergone a $2.4 million interior upgrade to better function as a theater. It also expands the theater company’s offices into the former fellowship hall in the basement and the former Shining Star Daycare, which was attached at the back of the church. While much has changed inside, the upgrade kept the bell tower, stained glass windows and much of the original flooring. “We wanted to honor the history of the building,” Weaver said. The play “Fences” shows there through June 10 with rave reviews. 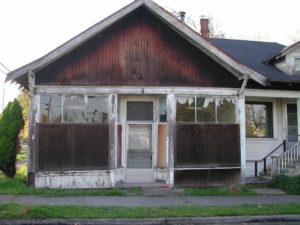 Doug Decker initiated his blog AlamedaHistory.org in 2007 to collect and share knowledge about the life of old houses, buildings and neighborhoods in northeast Portland. His basic notion is that insight to the past adds new meaning to the present. If you have a question for him to answer in CNews, send it to CNewseditor@ConcordiaPDX.com. The Oregon Stamp Society building at 33rd Avenue and Alberta Court may not look like a fire station now. But it did in the early 20th century. The historian reports: Good eye. 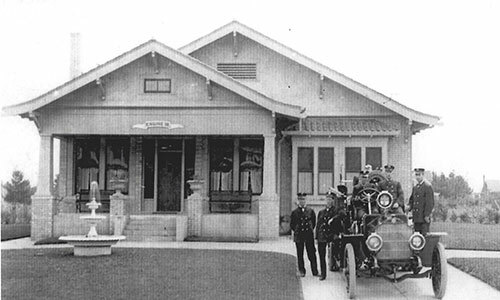 The building in question – 4828 NE 33rd Ave. – is the current home of the Oregon Stamp Society (OSS) but was originally constructed as a fire station, home of Engine Company 34, built in 1928. The station was opened and dedicated Nov. 1, 1928, with Captain Dan Shaw in charge and R. Mitchell as junior captain. Over the years, the station also served the neighborhood as a polling place, toy drop-off during holiday charity drives, and the focus of summer community barbecues and open houses. During the teens and 1920s, a series of similar small fire stations – that each typically housed just one engine and were known as “three-man stations” – were constructed in the heart of Portland’s residential neighborhoods. They were designed to fit in. Have a look at similar stations at 2200 N.E. 24th Ave. and at Southeast 13th Avenue and Tenino Street which, incidentally were also decommissioned in the late 1950s. Portland Fire Chief Lee Holden (1925- 1927), who was also an amateur architect, designed these stations. Holden’s attention to details – the choice of red brick, the wide and inviting gables and exterior columns, the operating multi-pane casement windows, the interior boxed-beam ceilings and classic interior wood trim –all speak to popular residential design elements of the period. Mechanical systems, according to OSS president Eric Hummel, have been replaced several times since the society acquired the building in 1960. The original garage door for the fire engine was on the front right of the station, but a casement window from the south side was put in its place when the opening was bricked over in the early 1960s. The station was functional until August 1959, when fire operations for the area shifted to the new station at 19th and Killingsworth (more on that in a moment), and Engine Company 34 was sent to serve the St. Johns neighborhood. The closure was the result of a reorganization of the Portland Fire Bureau by city commissioner Stanley W. Earl and a $3 million bond measure passed by voters in 1957 to build seven new stations across the city. The OSS purchased the decommissioned building in 1960 for $13,500. Reportedly, a church was vying to acquire the building as well. The neighborhood mounted a major protest in 1959 when city council chose the site across from Vernon School as the location of the new fire station. Any CNews readers remember that uproar? We’re also looking for any photos of the old station during its years of operation. Stay tuned for details in a future column. Have a question for the neighborhood historian? We love solving mysteries. Send your question to CNewsEditor@ConcordiaPDX.org and we’ll ask Doug Decker to do some digging. When I moved into our house in March 1962, there was a Joe Bernard Realty office in the building where Doggie Business is now. Joe said this area was part of the Bernardo family farm and there were chestnut trees from 42nd Avenue to 33rd. My question: were there chestnut trees all along Alberta Court? We really like questions like this, which require us to do some genealogy, some geography and some general asking around. Joe Bernard was actually Joe Bennard, who was born in 1901 as Joe Bennardo. Joe ran a real estate company based in an office, now gone, that he built facing Alberta Court directly behind today’s Doggie Business. Joe built the Doggie Business building in 1937, originally a tavern and restaurant. Joe and his brothers – the brothers kept the original family name Bennardo – lived in the neighborhood, and one brother built the house three doors north on the west side of 42ndAvenue. But we weren’t able to verify if the Bennardos actually owned a farm, or what extent it may have covered. The American chestnut (Castanea dentate) was a common tree in all American cities, but suffered a major disease outbreak that drastically reduced its numbers by the mid-1930s. It seems unlikely that enough of these great old trees would have been left mid-century to have lined Alberta Court. And of course it was called Alberta Street then and traveled along through open fields and forest stands. We pulled up a series of aerial photos from the 1920s and 1930s that show the western stretch of the street, and we don’t see a line of trees in this area. We did connect with a former paperboy who delivered newspapers along Alberta Court in the late 1940s and, although he remembered homeless camps there along what was the city limits, he didn’t recall seeing any orchard or line of chestnuts. This doesn’t mean there weren’t chestnuts along Alberta Court, just that evidence is scarce. In fact, it does appear there is a lone survivor of what Joe was remembering. You can find a beautiful old chestnut tree today at the northeast corner of 41st Avenue and Alberta Court, reminding us they were, indeed, in the neighborhood. We’ll keep digging on this and welcome any information from CNEWS readers. We love solving mysteries, so if you have a question for the neighborhood historian, email it to CNewsEditor@ConcordiaPDX.org and we’ll ask Doug Decker to do some digging. Development of the streetcar line changed everything about the landscape that eventually became our neighborhood. It takes lots of imagination to conjure up a picture of what our neighborhood might have looked like 100 years ago. The fields and forests of today’s Alberta district, Vernon, and Concordia were way out in the country, beyond the far edge of Portland. But one key development changed all that: the Alberta Streetcar. A photo from June 1940 looking north on NE 30th of the Alberta Streetcar at its far northern end, NE 30th and Ainsworth. Only the building on the northeast corner remains. Photo courtesy of City of Portland Archives. First constructed in 1903, the line left downtown at SW 2nd and Alder, crossed the old Steel Bridge and ran north up Union (today’s Martin Luther King Jr. Blvd. ), where it turned east on Alberta to NE 25th. A few years later it was extended five blocks east on Alberta to NE 30th, and then a few years later north on NE 30th to Ainsworth, which became the end of the line. The fact that autos were not the primary mode of transport in those days meant streetcars—and lots of foot traffic—fueled growth of the business district along Alberta. It was a thriving place of activity and commerce, not unlike today. But by the 1940s, with automobiles dominating the transportation picture and Union Avenue no longer the main north-south travel corridor (travel had shifted to Interstate Avenue), the Alberta streetcar became disused and was eventually replaced by a bus. By then, Portland had turned its back on its once robust streetcar system. The last day for the line was August 1, 1948. 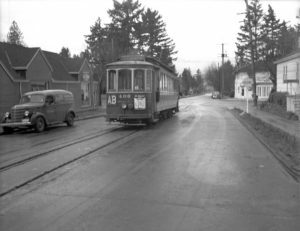 Check out Northeast Portland neighborhood historian Doug Decker’s blog www.alamedahistory.org for more on local lore, including the history of the nearby Broadway Streetcar line. ASK the Historian: Have a history question that needs to be solved? Drop us a note and we’ll put Doug Decker on it. Email CNewsEditor@ConcordiaPDX.org. The bungalow grocery at NE 27th and Going at low ebb, about 2002. This photograph shows just how far down the building had faded during its later years and why it was a leading candidate for the wrecking ball. Photo courtesy of Chad Crouch. Picking up where we left off, one of our favorite momand-pop grocery stores, at the northwest corner of NE 27th and Going, had risen from a vacant lot in the midst of the Alberta District’s 1909 muddy streets, to a men’s clothing store in 1911, to a vibrant neighborhood grocery run by a local family from 1921 to 1943. The photo featured in the April edition of Concordia News showed proprietor Agnes Coulter out front of the store—Alameda Park Grocery—in its prime. But during the war years, like so many things, shopping patterns were changing. In 1943, Isabelle Coulter sold her pride and joy to Charles and Vera Fiebke who held it for just a year before selling it to Henry and Ruth Rieckers, who owned the business until 1953. During this decade, the business was referred to as “Rieckers” and as “Rieckers Grocery.” A classified advertisement in The Oregonian on March 3, 1953 indicated the Rieckers were retiring and putting the business up for sale, asking $6,500. On June 24, 1953, the property was purchased from the Rieckers by John Henry Moad and his wife Lucy Jane Moad. They operated the store—as Moad’s Grocery—from 1953 to 1961 when it was sold to Robert A. and Louise M. Klatke, who changed the name to Bob’s Quik Stop Market. But the Klatkes didn’t hang on for long. An article in The Oregonian on June 29, 1962 reports a robbery at Bob’s Quick Stop. Klatke, age 56, was robbed with a knife to his throat. A few months later, he and Louise put the store back on the market, selling it to Agnes Martin on November 2, 1962. Then, sometime during the mid-1960s, the building ceased functioning as a store. The Martin family owned the property for the next six years and at least one reference to the building shows it as the Mt. Zion Church of God in Christ. The Polk City Directory for 1965 shows the building as vacant, and in 1967, it is listed simply as L.S. Martin. On September 17, 1968, the Martins sold the property to Carl E. Bass (son) and Viola Matheson (mother). Bass, who was a potter, turned the space into an artist’s studio and lived in the property until his death in April 2001 at the age of 73. The property was purchased from the Bass estate by investor/developers George and Isabelle Zitcak, who held it for just four months before selling it in April 2002 to Chad Crouch and Sheryl Eckrich. This is where the story gets interesting, which will be the subject of our final installment in the next edition of Concordia News.